Many people were hoping to take BART to see a July 4 fireworks show, including the big one in San Francisco, but they're out of luck. It's Day 4 of the BART strike. Both sides spent the holiday meeting at Caltrans headquarters in Oakland. It appears not much progress has been made. Wednesday, the two sides spent 10 hours negotiating. Now, one thing both sides have agreed on is how ugly this has turned. Union leaders spent their lunch break away from contract negotiations at the Lake Merritt BART station, where dozens chanted in protest. “We’re ready to go another month,” said one protester. BART headed into its fourth day of the strike on July 4, a day when traffic was lighter due to the holiday. Talks began at 11 a.m. Christie Smith reports. While state mediators have asked both sides not to talk to the press, the SEIU pressed forward, inviting media to listen in as leaders updated their union members. 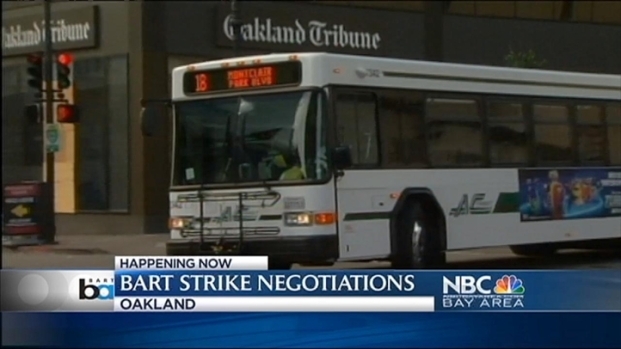 “We’re not close to an agreement,” Bart union leader Pete Castelli said. BART announced it has received no indication striking unions will return to work Thursday. Terry McSweeney reports. There were complaints about the absence of BART General Manager Grace Crunican in the talks. BART spokesman Rick Rice says she has taken one day off to attend her father’s funeral. The tension peaked when members of the other BART workers’ union, the ATU, walked up to listen to the BART spokesman’s response. What’s also caught the attention of both unions are the special BART board meetings that have been scheduled and then canceled several times this week. On the agenda: the possibility of BART walking away from negotiations. With no BARt service, some Bay Area residents say they will abandon plans to head to San Francisco to celebrate the 4th of July. Jean Elle reports. 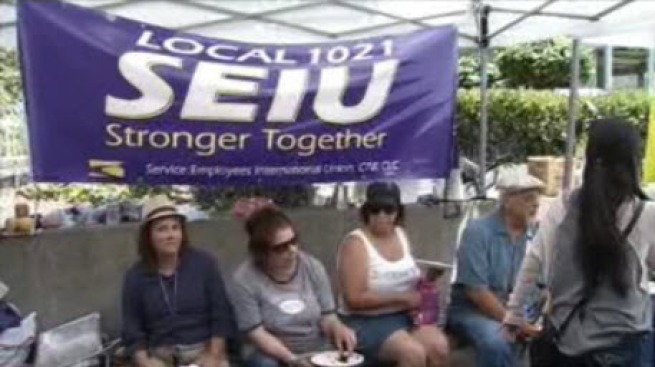 Both unions say they believe management may impose a contract, which would keep workers on strike. Even if strike were to end, BART says it needs 18 hours to get the system fully running, so charter bus service will continue. Authorities said commuters should continue to make alternative plans for most of the July 4 festivities throughout the Bay Area. BART announced it would provide limited charter bus service to and from San Francisco during peak commute periods during the Fourth of July holiday starting at 6 a.m. from five East Bay stations and 4 to 6 p.m. from San Francisco. Friday’s service will be similar, but each station will have seven buses show up at 5 a.m. The service will only last until all seven buses are filled or until 8 a.m., whichever comes first, the release said. The return trip home will be from 3 to 7 p.m.
AC Transit also planned to run more buses during the Fourth of July holiday in anticipation of people attending baseball games, America's Cup yacht races, fireworks shows and other events scheduled throughout the Bay Area. The transit system will run on its Sunday schedule and add an additional 11 buses to run at twice the frequency on Thursday, officials said. Buses on the system's NL and F lines will run every 15 minutes as opposed to every half-hour. Normal weekday service will resume on Friday and run buses on the system's 800 line every 30 minutes, which will include three extra buses late in the evening from San Francisco's Market Street to downtown Berkeley and Richmond via San Pablo Avenue. AC Transit is also considering adding additional service on Saturday and Sunday pending an assessment of available resources such as equipment and personnel, authorities said.